Erickson, but the world is growing smaller as they use their wings to travel far. Rebecca Louise, daughter of Norval and Joan Lee, was born on April 9, 1971 in Erickson. After completing grade 12 at Erickson Collegiate, she attended the University of Manitoba, achieving a Bachelor of Social Work degree. She worked for Child and Family Services of Western Manitoba, living first in Brandon, and then in Boissevain. In 1994, she married Scott Anthony Gray, born December 4, 1966, in Winnipeg. Scott was a professional foster parent with MacDonald Youth Services and, after their marriage, they continued fostering together. Shortly before the birth of their first child, Rebecca resigned from her social work position. On March 23, 1996, Mathias Johann Lee Gray was born in Deloraine, MB. Scott worked as a teacher's assistant and then as school guidance coun­ selor at Boissevain School while Becky started a home-based business doing custom sewing. In 1997, they participated in a Declaration of Commitment Ceremony with their foster child, Jesse Kent, (born September 29, 1986 in Winnipeg) making him a permanent member of the family. Scott and Becky decided to foster other chil­ dren on an emergency basis only. Later, in 1997, the Gray family moved to Erickson, where they joined parents Norval and Joan in farming. They took up residence in the former Bergeson home, just north of town. Expecting another child, they began looking for larger living quar­ ters. Ultimately, it was decided that Norval and Joan would build a new house on the farm, and Becky and Scott moved to her parent's previous home. Emma-Lee Rebecca Gray was born on October 16,1998 in Minnedosa. Construction was completed on the new house in Febmary 1999 and everyone settled into their new residences. In addition to farming, Scott works in a group home. He is an avid curler, was president of the Erickson Curling Club in 1998-99, and mns the Junior Curling Program. Scott is a member of the Erickson Lions Club. He also enjoys golfing and gardening. Becky's sewing business keeps her very busy. She teaches Sunday School and enjoys curling. Ken and Jackie Greavett (nee Piett) purchased the Einar and Lily Magnell farm in March 1999. Ken was born in Belleville, ON in 1956. Jackie was born in Erickson in 1956. 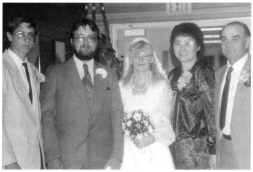 They were married in 1979 and lived in Onanole. They raised three daughters: Stacy Jo 1981, Jasmin Nicole 1983 and Tiffany Quinn 1985.
with W. R. Piett Insurance from April 1982, purchasing the business in 1985. Jackie worked at the Royal Bank from May 1979 until 1985. Then she received her insurance license and is currently part-time at Parkway Insurance. Ken and Jackie are planning to move into their new home on the shore of Otter Lake, on SE 33-17-18, early in the new year. John retired from CNR, after 37 112 years, III September of 1992. During his retirement, he has enjoyed ice fishing and seldom came home empty handed. He picked up a hobby of building birdhouses and feeders and has become quite good, after hitting a thumb the odd time. John is also very active with the Erickson Legion Branch #143. He received a Certificate of Appreciation for 15 years of service as an Honorary Member in 1998 and has been on the Entertainment Committee for 16 years. Marge has been working with Home Care and received her 10 year certificate in 1999. As of September 1999, she became semi-retired, but still enjoys working part-time. She has volunteered her time for the Homecoming 2000 Committee as Registration Convenor.